Standard reinforcing mesh sizes are 6.0m x 2.4m. 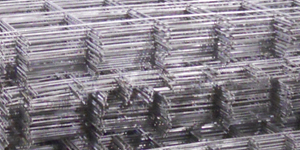 The wire used in our reinforcing mesh has a ribbed profile. This ribbed profile improves bonding to concrete, which when compared to smooth wire profiles, minimizes any concrete cracking that may occur as a result of concrete shrinkage.